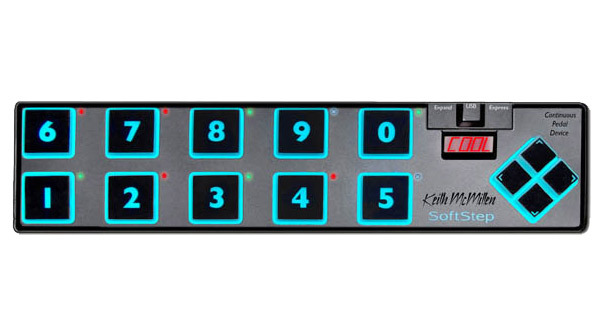 The engineers behind Keith McMillen Instruments are touching on a not-so-new concept that using one’s feet frees up the hands to do more work with the SoftStep KeyWorx USB device. This is a gadget that is basically a sophisticated pedal which has ten pressure and direction sensitive keys and a navigation pad. It allows people who use it to control all kinds of computer applications with their feet so that their hands are able to work without stop. This USB gadget, while perhaps the first to allow such actions as controlling the curser, sending out keystrokes and controlling volume on a computer system from a USB foot controller is certainly not the first USB foot pedal to be used in conjunction with a computer. Ask anyone who has ever dabbled in digital transcription. The idea of using the feet to help improve speed is a pretty old one; take, for instance, the sewing machine. However, the SoftStep Foot Controller is indeed far more complex and it is touted as being able to be used by musicians, data entry professionals, the disabled, those hoping to avoid Carpal Tunnel and RSI; and more. Those who developed it claim that it is no different than driving a car, and that with dedication its use can be mastered. I suppose it can, but it is going to be far less simple to control ten fairly small keys and even smaller navigation arrows than the gas, the brake and the occasional clutch. It is pretty cool to assign all of the buttons on the pedal their own unique functions, which is done through the SoftStep KeyWorx free software. The idea is a good one and probably is ideal for many niches. The question is whether those who do not require hands free function are going to dish out the $290 for it–and the SoftStep’s creators shouldn’t expect it. Undoubtedly, the concept of using the feet to allow a user to have hands free control of the keyboard, or in the case of the disabled, having the control of the keyboard extended to the feet, is exceptional. It just seems highly unlikely that many users are going to be able to truly master using this USB gadget without looking down every time they want to turn up the volume. Heaven forbid that the user has big feet! Love it or hate it? Give your input for the SoftStep KeyWorx USB device. This entry was posted in Articles, SoftStep KeyWorx USB Device, USB Devices, USB Gadgets and tagged Keith McMillen Instruments, Keith McMillen SoftStep KeyWorx USB Device, SoftStep Foot Controller, SoftStep KeyWorx free software, SoftStep KeyWorx USB device, USB foot pedal, USB gadget. Bookmark the permalink.